SPOKANE, Wash. – On one side of a knot of overpasses and railroads is Spokane’s thriving University District. On the other is the East Central neighborhood, where 63 percent of residents live at or below the poverty line and fewer than one in three own their homes. Using smart design and technology, students at Washington State University are working to break down barriers between these adjacent areas. 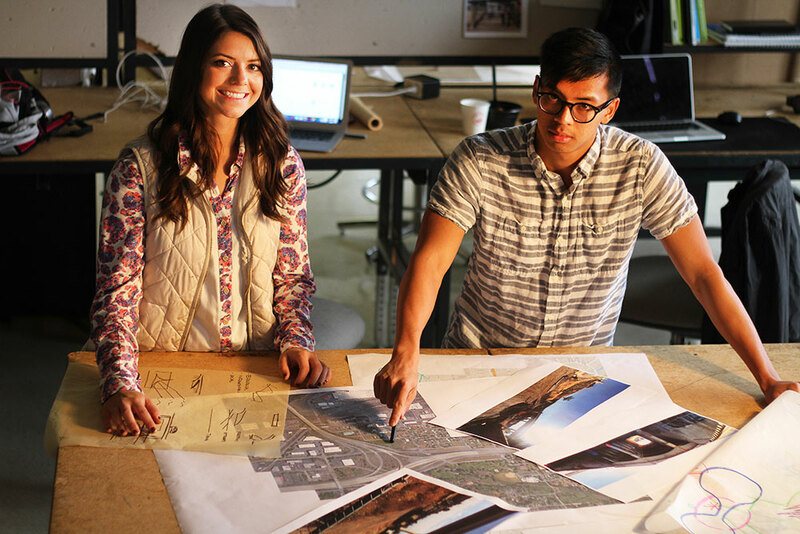 Their ideas could help East Central residents take advantage of education and health opportunities next door, said Steve Austin, instructor in the WSU School of Design and Construction (http://sdc.wsu.edu/). Students in the school will present their ideas at an open house 2-6 p.m. Friday, Oct. 23, at the WSU Spokane South Campus Facility Court, 410 E. Spokane Falls Blvd. On a computer, Andrew Cristiani, a senior from Los Angeles, tabs through overlays of East Central’s streets, trails, railroads, water lines and bus routes. One desk over, Weik, a native of Renton, Wash., has cataloged the neighborhood’s residential and business areas, restaurants, bars and grocery stores. “A lot of people think that landscape architecture is just about flowers and shrubs,” Cristiani said. But before a landscape can be changed, its architects have to understand the many systems at play, from the pipes to the parks. The University District (http://www.spokaneuniversitydistrict.com/), which brings together universities and businesses north of I-90 and east of Division Street, is being transformed by private, state and federal investments including WSU’s new Elson S. Floyd College of Medicine and a $15 million University District Gateway Bridge across the Spokane River. A pillared East Central underpass could become a connecting pathway, said WSU instructor Steve Austin, right. His students are finding ways to link Spokane neighborhoods as a class project. The district also connects the strengths of educational institutions with regional economic drivers like the WSU medical school, he said.